Developed by a type 1 diabetic, the HangTite offers a very affordable solution to common issues with insulin pens and helps improve diabetic care at home, school and work. Insulin pens offer many benefits to Type 1 and Type 2 diabetics, but while they are one of the top insulin delivery methods utilized by diabetics, they still come with unique challenges. Tony Fontecchio, a type 1 diabetic, created the HangTite insulin pen holder. The newly released HangTite insulin pen holder, created by Tony Fontecchio, helps solve some of the common problems that users experience when using pens instead of vials and syringes or insulin pumps. Insulin pens continue to grow in popularity across the world, and in a previous study on “Insulin Pen Use in the United States and the United Kingdom,” the authors noted that insulin pens have now become the “dominant delivery system” across much of the world. One of the main reasons insulin pens continue to grow as an insulin delivery method is how easy they are for patients to use. One study showed that more than 95% of insulin pen users found this insulin delivery method easy to use, while just over 46% of conventional users felt their delivery method was easy to use. Beyond ease of use, insulin pens offer a discrete way to carry and administer insulin, since they can easily be slipped into a pocket or purse. Other benefits of using insulin pens include reduced pain with injection, accurate dosages, and increased flexibility, which results in increased compliance to an insulin regimen. Although insulin pens offer many benefits, they come with some disadvantages that can affect compliance to home care. One of the biggest challenges to using insulin pens is keeping them organized. Since they have to be stored in a refrigerator, it can be difficult to keep them stored in an organized manner that makes them easy to keep track of. It’s always essential for patients to know how many pens they have on hand, and if pens are disorganized and difficult to find in the fridge, it’s difficult to know how much insulin is left. Beyond the organization problem, insulin pens can take up valuable space in the refrigerator, a problem that becomes frustrating to everyone. Patients often try to stash them in the butter compartment to keep them under control. Other patients find it’s frustrating to have insulin pens falling out of the fridge or moving around inside the fridge. Since insulin pens are expensive and often hard to get covered by insurance companies, losing pens while trying to store them is even more upsetting for diabetics. Tony Fontecchio, developer of HangTite, is personally familiar with the frustrating challenges that come with using insulin pens. After dealing with the challenges of insulin pens for years, Fontecchio decided to develop a solution – the HangTite insulin pen holder. “The HangTite insulin pen holder is designed to mount inside your refrigerator and neatly organize your insulin pens so you can see how many insulin pens you have at a quick glance,” states Fontecchio. 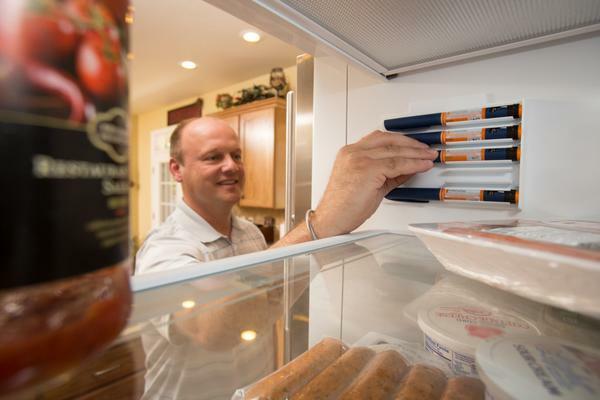 Available in blue and white, the HangTite insulin pen holder is easy to install inside a refrigerator, and it installs out of the way so diabetics don’t use up valuable fridge space for insulin pen storage. Since pens snap right into the holder, it’s easy to see at a glance how many pens you have on hand, which can keep users from running out. Pens are kept organized in one easy location, keeping pens from moving around or getting lost. Simply place pens into the holder and get rid of the bulky boxes they’re packaged in. To learn more about the HangTite insulin pen holder and how it can solve your insulin pen challenges, visit http://www.thehangtite.com for more information. The HangTite is currently available for only $14.95 and shipping is free, so it is a very affordable solution for anyone living with diabetes. Great idea. I wish I would have thought of it. Excellent idea. Why hasn’t this been invented years ago?